This is the first feature for writer and director Eli Craig. As he told us in the Q&A following the screening, people told him that this project was a mistake, that is was a bad idea and that a guy jumping headfirst into a wood chipper just wasn’t funny. I and more than a few others are glad he didn’t listen. A self-admitted comedy writer who grew up with horror movies, but had grown bored with them, Craig gives us a fresh and loving spin on the genre, more respectful and funnier than any spoof movie has ever thought about being. Yeah, I’m looking at you “Scary Movie” franchise. Now, if you’ve seen the sizzle reel that got leaked onto the webternets back in October, you’re probably got a good idea of what’s going on in the movie. Tucker (Alan Tudyk) and buddy, Dale (Tyler Labine) are heading off into the mountains to Tucker’s new fishing cabin – and by new, I mean a busted up old cabin that looks like it was airlifted off the “Evil Dead” set, but it’s new to Tucker. On their way, they encounter a group of college kids off for a weekend of debauchery in those very same mountains. During a brief encounter with them at the local bait shop, Dale, with Tucker’s encouragement, works up the nerve to talk to one of the lovely co-eds, Alison (Katrina Bowden). It doesn’t go well and the kids beat a hasty retreat from the scary hillbillies. Later, a skinny-dipping accident plus two hillbilly good Samaritans are all you need for the bloody and hilarious events that follow. And what follows is pure greatness. Horror comedies generally fall into three groups: the good (“Army of Darkness”), the bad (“Transylmania”) and the what-the-hell-were-you-thinking? (“Scary Movie 2” and on). “Tucker & Dale” clearly falls into the first category. Why? First and foremost, Craig clearly knows and loves the genre. He know what makes it’s dark little heart beat and knows how to make light of it while still being true to its essence. It’s never an exercise in trying to find a way to slap skewered scenes together lifted from other movies. Never once did I find myself thinking, “Oh, that’s like that scene from that other movie.” He pulls of the tough trick of taking something old and making it feel new again. Of course, he has a great cast to pull it off with. 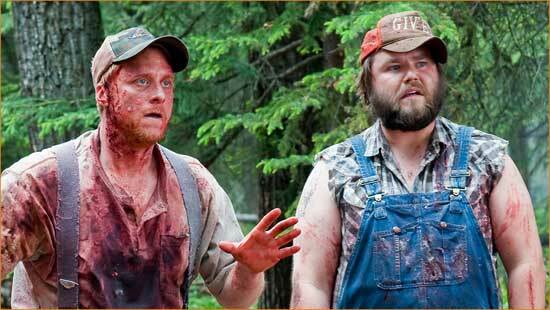 Tudyk and Labine work perfectly together as the not your ordinary horror movie hillbillies. Tudyk, I’ve been a fan of his comedic gifts since “Firefly”, but I’m new to Mr. Labine’s work and I’m definitely now a fan. The supporting cast of “college kids” all do great jobs – though I have to say the film’s first few moments made me a little concerned, they stepped up and each gave us great moments, particularly Jesse Moss’ type-a douchebag, Chad. If you ever see Eli Craig out and about, shake his hand and buy him a beer. When you succeed when everyone around says you won’t, congratulations and celebration are in order when you do, and “Tucker & Dale vs. Evil” succeeds in almost every way.